Sand blasting or abrasive blasting is a metal finishing process used to clean and/or etch a surface by a selected abrasive forcibly propelling against the product surface. Sandblasting works on a variety of surfaces including metal, wood, concrete, brick and stone. Sand blasting is often used to remove rust and paint to older surfaces of products. This process prepares the products for further metal finishing services such as powder coating etc. 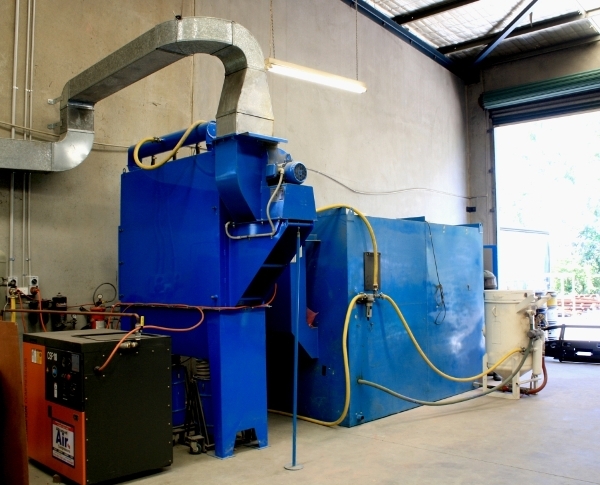 The capacity of the sand blaster facility at All Metals Powder Coating is 1.8m wide x 1.9m height x 3m depth. Bead blasting is the process of removing surface deposits by applying fine spherical acrylic or glass beads at a high pressure without damaging the surface. Bead blasting is mainly used on stainless steel and aluminium surfaces. It is appropriate for metal as the small beads do not remove any metal from the products. Examples of its use would be the removal of paint from products such as auto body work. Sodablasting is a non-destructive process in which sodium bicarbonate is applied against a surface using compressed air. Soda easily removes carbon, grease, oils, gasket material, surface corrosion, paint and coatings from a variety of alloys, plastics and composites without substrate damage or distortion, and leaves hard anodized coatings intact. Soda blasting is very effective for mould and fire/smoke damage cleanup as it cleans and deodorizes. Shot Blasting is the process of propelling rapidly a controlled stream of abrasive material such as small steel balls, granules of silicon carbide etc, toward the surface of the material. This removes and cleans the surface of the object, including removal of scale, excessive aggregate, old paint, rust and burrs. Commonly used for scaffolding cleaning, cleaning of iron, steel, foundries parts, automotive components and preparation of surfaces to be painted. AMPC use a range sand grits to achieve different metal finishes. Large grit is used for general use and is similar to 100 grade sandpaper. It is used for applications such as outdoof furniture, car parts, railings etc. Fine grit is used for more delicate projects and projects that require in smoother finish. Typical applications include softer materials such as copper. Aluminium oxide is mainly used for stainless steel items and is similar to 200 grade sand paper. The aluminium oxide is non-metallic and will not contaminate the surface to be blasted.